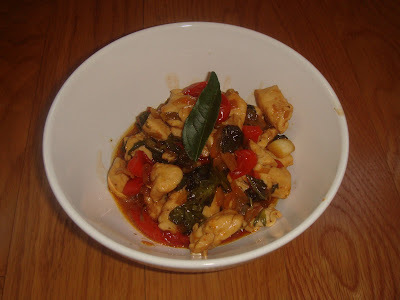 This is Rebecca's Version of Thai Basil Chicken quick and easy to make, full of flavor and great with rice and vegetables. Hope your all having a fab weekend, the weather was lovely today in NC Jasmine, her daddy and I enjoyed a long walk. I am also on my 4th loaf of bread! Looks yummy. I have been loving Thai food lately! I love that chicken dish!Sounds simple, but full of flavor. I have never had Thai basil. I must go to my local Asian Grocer and look. I am sure it makes any dish with similar ingredients taste yummy. Two of my favorite flavors! Thai and Basil! Yum! I am insanely in love with thai basil curries....totally! This looks scrumptious....bring it on! Mmm...looks so delicious. Must try to make this soon. Thanks! Yummy! I haven't cooked for about 5 days now. We're on vacation, returning to snow and cold temps tomorrow. Looks good, but no chicken for me. My high schools last week told me they felt bad for me so i had to explain it is a matter of personal choice, personal likes and personal dislikes, so if I do not like to eat chicken, why feel sorry for me...I didn;t give up something that I enjoy. They understood that and I think that shows some level of maturity from a good of 9th grade guys. They never thought of it that way. Looks good. I really need to start spending some time in the Asian grocery stores. Some many great items I'm missing out on. Peannuts: one coming up tomorrow! I confess I've never tried chicken with basil.. Sounds delish!!! I have to try this. I love basil in anything. This looks to be an easy week day recipe to make as well. the thai basil adds a nice touch - this chicken dish looks and sounds so delicious - we are staying in today - rainy day in NYC - yesterday we went to a book signing and vegan cooking demo from a fellow blogger. Lovely recipe. Easy and full of flavor. Warm and sunny in California, but we are expecting heavy rains this next week. This looks great! I've gotten Thai basil at the farmer's market before and wasn't sure exactly what to do with it, I'll have to try it! Love thai food. Looks yum. Wonderful! I love Thai flavours. Lovely dish! I also posted about homemade bread a couple of days ago...must be that time of year! How delicious Rebecca! Lovely flavors! This looks great! I haven't tried too many Thai dishes, but this one is going on my list. The sauce looks so flavorful! Basil chicken. Thai food. Yes - it has it all. Scrumptious. Ooh, sounds fantastic; extra chiles for me! I bookmarked this! I really want to try this for my family!! !